A tutorial on how to shoot rainfall with a digital camera. 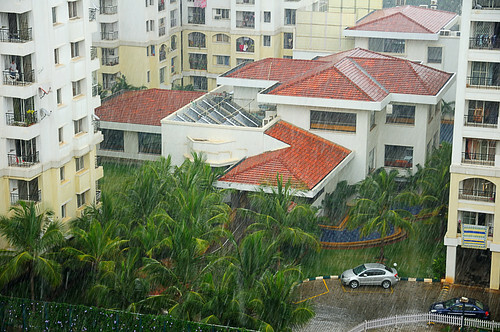 With the monsoons doing their usual thing and I having the luxury of a not-too-bad view of the rains, I had been itching to capture a shot of the rain in all its glory. Earlier this year I made a capture that brought out the rainy-ness in the scene but didn’t have any rain as such. Online research about shooting the rains didn’t bring much enlightenment because there’s no “formula” for making rain shots. It all depends on what you want to portray. For me, that would be about the prominence of the falling streaks of rain. All I knew was that I had to shoot a somewhat low shutter speed for that. This Sunday, there was a brief spell followed by a longer shower, and I jumped at the opportunity (you don’t keep your camera nicely packed and hidden in your closet, do you?). The only thing I knew was that I had to shoot at 1/60s in Shutter Priority (S) mode. All of the first spell went in experimentation with other settings and by the time I got the hang of it, the rainfall had thinned out. Thankfully, it returned even stronger, so I got a nice shot, but in case you only get a brief opportunity, here are my observations that might help, right after the photograph I got. Mind Your Background: The streaks of rain are most visible when they capture the light of the sky and there’s a dark background to contrast them against. Foliage works as the best background, both due to its dark colour and because the trees look so different when they’re wet, thereby adding to the “feel” of the photograph. In most cases, if you can see the rain, so can the camera. Don’t Use Cloudy WB: If you’re shooting RAW and you play with WB settings while developing, you’d notice that using Cloudy/Shade WB makes the rain streaks almost disappear. This is because the rain-drops are visible only because they’re reflecting the sky and Cloudy WB tends to flatten the sky colours. If you shoot JPEG, this is the make-or-break setting. I used Daylight/Sunny setting for the above shot. Over-expose and Pull: There is not much dynamic range in a rainfall scene. To get a nicely contrasty and colourful photograph, expose to the right and then pull back the scene while developing (e.g. adjust your black point to the extent that you begin seeing some dark spots in the photo). The above shot was made at +2/3 EV over-exposure. This only works if you’re shooting RAW. Mind the ISO: Some times, the scene may become so dark when it’s raining that the camera may not be able to give a good exposure at 1/60s, even with maximum aperture. Watch out for signs of this (e.g. if the aperture reading in your Nikon’s viewfinder says, “Lo”) and bump up the ISO. The above photo didn’t have this problem but some other shots required ISO-400 at max aperture (~ f/5.6). What Aperture? The above shot is made at f/5.3 but I got decent shots up to f/11. Seems like aperture doesn’t make a huge difference. So, go ahead and try creating your own rain streaks. If you find any of the above tips helpful or not helpful, do drop a me a comment.